Even better than book 1. :)Some books get a high rating for the story (the story was okay but it's not going to be winning any literary awards, heh). Some books get a high rating for an emotion that it evoked in me. This story did me in because of one character - Graham. He just made it to my list of favorite book guys of all time. He is the anti-alpha and admits it fully. Don't get me wrong - I love me a good alpha, but after realizing some months ago that YA fiction was being overrun with drop-dead perfect male types, I started craving characters who weren't the same as everyone else. So started my obsession with characters like St. Clair from Anna and the French Kiss, Matty from Flat-Out Love, etc. Now I can add Graham to this elusive list. 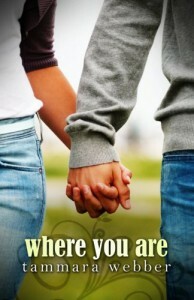 Especially in Where You Are, the second book to this series. We got a little bit of an insight to Graham at the end of Between the Lines (book 1), but he really got to shine in this one. I'm about to become a gushing puddle of fangirl, and I really hate to let this side of myself go, unless I'm talking about Richelle Mead, who is the one person I make an exception for.Side note...okay, I swear I'm not having some weird fetish with books featuring people holding hands. In fact, I don't know if I've read any books with hand holding couples until just recently. This whole thing just happens to be a coincidence. After reading book 1 and being blown away by the ending, I had to immediately download book 2 and start.